Not only is homemade soup delicious and soul-satisfying, it’s a great way to use up all sort of leftovers you may have in your fridge. Sometimes this even leads to new flavor combinations you may not have otherwise tried. 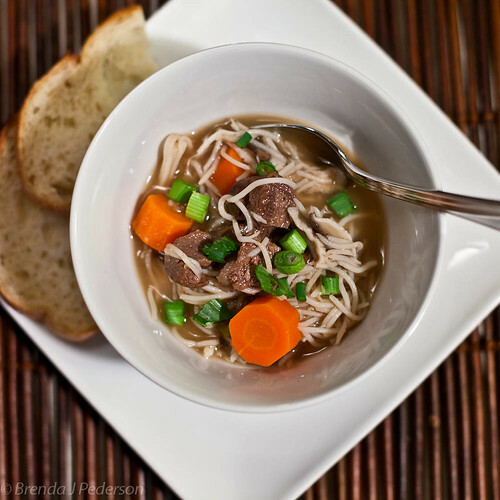 The ingredients that inspired the soup in the photo were a partial onion, a small bag of mushrooms, a couple of carrots, leftover elk steak and some beef broth. I started by sweating the onion, a few cloves of garlic and a small piece of ginger. Then added the carrot and a couple of bay leaves and sautéed a few minutes longer, then added the mushrooms. Next, about 2 or 3 cups of broth went into the pot. I brought the soup to a boil and let it simmer for about 15 minutes to allow the flavors to develop and merge. Next I added some rice noodles and when they were about half way done I added the chunks of elk, which was already cooked. I wanted to warm the meat without cooking it to death. After scooping the soup into bowls I topped it with a little chopped green onion. Add a couple of slices of bread and maybe a nice green salad and you have dinner!